MIPSGAL is a 278 degree Galactic plane survey conducted through the Multiband Infrared Photometer for Spitzer (MIPS) instrument on the Spitzer Space Telescope. The survey extends over |b| < 1 for 5 < l < 63 and 298 < l < 355 and maps strips from 1 < |b| < 3 for -5 < l < 7, at 24 and 70 microns. The innermost region of the Galactic plane is covered by another Spitzer mapping program (Spitzer program ID 20414). MIPSGAL is complementary to the GLIMPSE legacy surveys at 3-9 microns using the InfraRed Array Camera (IRAC) on Spitzer. The MIPSGAL survey was designed to match the spatial coverage of the shorter wavelength infrared survey. These infrared surveys occupy an important niche in the growing set of surveys covering the plane of our Galaxy across an increasing span of the electromagnetic spectrum. The main science goals of MIPSGAL are to identify and study massive stars forming in the inner Galaxy and investigate the distribution and energetics of interstellar dust in our Galaxy. The combination of MIPSGAL and GLIMPSE is extremely sensitive to young protostellar objects as evidenced by these color-color diagrams. Emission from stocastically heated very small dust grains (VSGs) comprises most of the extended emission in the 24 micron passband. The 70 micron passband contains emission from both VSGs and larger dust grains. Coupled with the 8 micron passband of GLIMPSE which is dominated by emission from polycyclic aromatic hydrocarbons (PAHs), MIPSGAL data can probe the grain size distribution, incident radiation field and other grain properties. In addition, MIPSGAL is well suited to studying evolved stars including luminous blue variables and Wolf-Rayets as well as supernova remnants. The resolultions of the survey mosaics are 6 and 18 arcseconds full-width half-maximum at the 24 and 70 micron, respectively. The 5 sigma rms point source sensitivities are 1.3 and 73 mJy at 24 and 70 microns. The 24 micron mosaics saturate for 2 Jy point sources and at a level of 1700 MJy/sr for extended sources. We are still characterizing the saturation levels at 70 microns but it appears that the values in the Spitzer Observer Manual are conservative. The main flux density artifact for the 70 micron data is not necessarily saturation, but flux non-linearty that starts at a level of 300 MJy/sr and becomes quite significant at 2000-10000 MJy/sr. To produce the mosaics, substantial image processing has been applied to the pipeline processed data. If you would like to know more about the processing, visit the Data Processing page. In addition, there will be unexpected phenomena in the survey data waiting to be discovered. 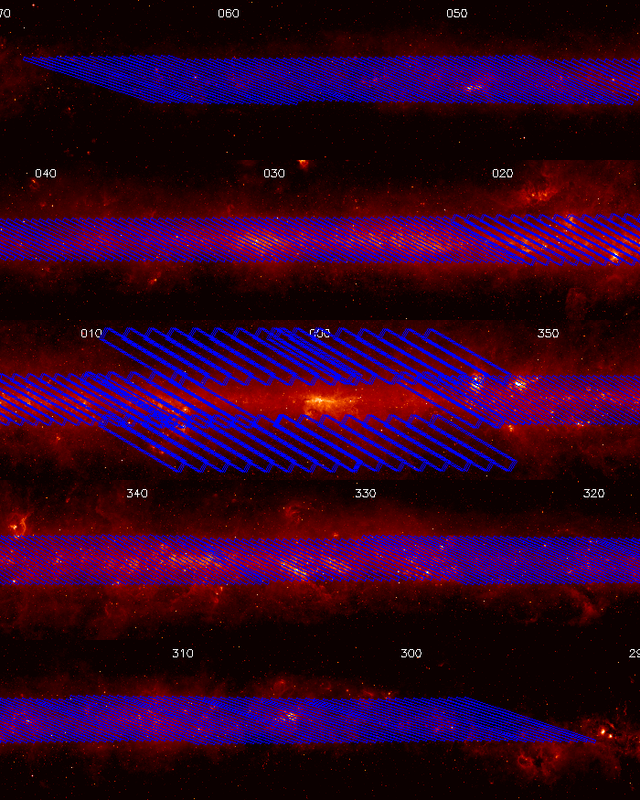 Infrared surveys of the Galactic plane have a long history of serendiptious discoveries. The pervasive 12 and 25 micron emission from the Galactic plane identified by IRAS revealed the presence of large molecules and very small dust grains in the ISM. 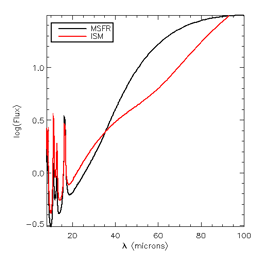 MSX and ISO discovered a population of dense molecular cores though their extinction in the mid-infrared. The Spitzer Galactic First Look Survey which covered a very small fraction of the Galaxy made the first infrared detection of a supernova remnant. The discovery space for MIPSGAL and GLIMPSE is large considering that they have better than an order of magnitude improvement in sensitivity and resolution over previous large scale infrared surveys of the Galactic plane. If you're interested viewing the mosaics or wish to obtain data from the survey then go to the Data Products section.